Stephen Negoesco was one of the most successful college coaches in the modern soccer era. He directed the University of San Francisco to glory at the Division I level, winning four national championships and 22 conference titles over a 39-year career. He amassed a record of 540-172-66 for a 72.5 percent winning percentage. Negoesco died Sunday at the age of 93, but his life was much more than about soccer. So, when something doesn’t go exactly right for Stephen Negoesco on the soccer field, he realizes that there can be worse things in life — much worse. He has been to the abyss, stared into it and walked away — run away — to have a fulfilled life. Indeed it is. 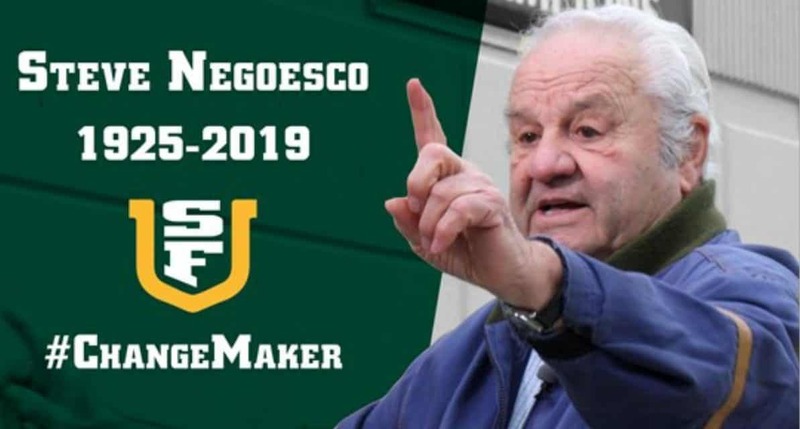 Negoesco is happy to have enjoyed a long and successful career as coach of the San Francisco men’s soccer team. Heck, Negoesco is happy to be alive, having endured an odyssey the likes of which are the subjects for books and made-for-TV movies. The abyss was a Nazi labor camp during World War II. Held captive as a teenager, Negoesco escaped, thanks to soccer. His fulfillment came as a father of six children, grandfather of 17 and great grandfather of 19. And as the winningest men’s coach in NCAA Division I history. And having the stadium where his team plays named after him while he’s still alive. But as Negoesco has discovered, life, indeed, is beautiful. His odyssey began in 1925 when he was born in Juplant, N.J. Some time later his mother passed away, leaving his father, a cargo sea captain, to raise a family by himself. Negoesco, then barely 18 months old, was sent to live with his father’s brother in Bucharest, Romania. His father could not have predicted the dark clouds that were to come over the horizon in the next decade and beyond. When the war started, Negoesco tried to return to the United States. He and his uncle had the money — $1,200 for passage, a sizable sum in those days — but they couldn’t find a route to get out. There were few or no trains or flights available. “Being an American subject by birth didn’t make it any easier for me,” Negoesco said. As a 15-year-old in early 1940, Negoesco wound up in Lager, a Nazi forced-labor camp in Germany. He worked in a factory doing manual labor. Compared to the brutality and death that transpired at concentration camps, Negoesco’s experience might sound like a summer vacation to the uninformed. “We’d eat potatoes and beats,” he said. “We’d find them and cook them. There were 16 of us in that room. Eight double bunk beds. We slept on straw mattresses. We had one blanket. You had to sleep in your clothes or you’d freeze to death. His tether to reality, sanity and eventually escape were several leather soccer balls. “Balls were very rare at the time,” he said. Thanks to his interest in soccer, Negoesco became friendly with some of the guards, many of whom were no older than himself. They played soccer on Sundays. “They told me to run away on a Friday because the commandant doesn’t come back until Monday to look for you,” he said. So, Negoesco took off on a Friday and never looked back. He eventually reached Bucharest through Vienna, Austria and Slovenia. “I was a scared little kid who thought the whole world was screwed up,” he said. “I thought it was a big joke. The Gestapo finally caught up to Negoesco, but thanks to a German named Brown, he wasn’t brought back to the camp. Negoesco stayed, playing soccer for a coal-mining town. “I was told I was building up the morale because I was a center forward who scored goals,” Negoesco said. In 1945, the communists took over. “They drummed up some charges, but I beat the charges,” Negoesco said, and soon he was finally able to return to the U.S. Even though he was an American by birth, Negoesco had to endure the discrimination of foreigners upon his return. This was the late 40s and early 50s — the paranoid era of McCarthyism. It didn’t help that Negoesco could speak French but not English at the time. But Negoesco also realized what he had — freedom and a life. As a 22-year-old freshman at the University of San Francisco, he juggled a job, classes and soccer. In relative terms, it was a snap compared with life in Lager. He became a player, then assistant coach to Gus Donoghue and eventually coach in 1962, starting with a $300 annual salary. At San Francisco, Negoesco directed the Dons to Division I titles in 1966, 1975, 1976 and 1980. A fifth was crown was vacated due to an ineligible player, a charge that Negoesco disputed over the years. His impressive roster of former players included former U.S. international defender and San Jose Earthquakes defender John Doyle, former Seattle Sounders goalkeeper Mike Ivanow, players from the Nigerian, Greek and Norwegian national teams, and former U.S. national coach Lothar Osiander. In fact, there were two games in which Osiander participated that stand out most in Negoesco’s mind, at the NCAA tournament in 1966. The quarterfinal was played in the rain at the home field of the defending champion, the University of St. Louis, during Negoesco’s first championship season. “The referee didn’t make it from Chicago for the game,” he said. “We didn’t have a waterproof ball. We didn’t have a timer [or an official clock]. I was very upset at the time. The ailing Dons had players with torn ligaments, broken bones, bone spurs and severe abdominal ailments (Osiander). 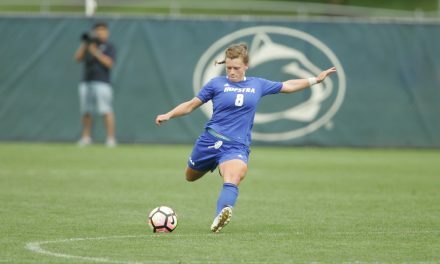 But they still beat Army in the semis and rolled over Long Island University in the final 5-2, a score that equaled the most goals scored in a Division I championship game. “We had a lot of spirit,” Negoesco said. Negoesco saw the sport grow from being an ethnic game to the point where millions of children play it every day. But he realizes that quantity doesn’t necessarily always mean high quality and that American soccer players still have much to learn about the nuances of the game. “Kids plays soccer, but they don’t watch soccer,” he said. “If you watch soccer, you learn to play a better game. When France once played Italy, Alain Giresse made a run from the middle of the field to the right wing; but [Michel] Platini didn’t pass him the ball. Giresse, however, drew the sweeper out. Platini made a through-pass and someone took the shot and scored. If Negoesco had his way, college soccer would be a two-season sport, beginning in the fall and culminating in the spring. All they have now is a short, spring season with exhibition matches. “We should develop the college game more,” he said. “Most kids don’t develop [as players] by 18. We should play soccer in the spring. In the fall we should play 10-15 preparatory games. They [NCAA officials] have no clue. By the time I’ve played 30 games, my best team is in April. The NCAA and its backward policies in sports other than football and basketball should take most of the blame. Negoesco admitted he doesn’t know what life after soccer coaching will bring (assistant coach Erik Visser will succeed him). He will be retained as a director of soccer, helping with fundraising. At the time of our interview, Negoesco did not know what was going to do after retirement. Whatever he did Negoesco probably cherished it. As he already knew, life, with or without soccer, is beautiful.